William Cronon. 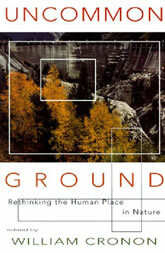 Uncommon Ground: Rethinking the Human Place in Nature. W. W. Norton & Co., 1996. The problem is that we haven’t learned to live responsibly in nature. The environmentalist aim of legislating humans out of the wilderness is no solution. People, Cronon argues, are inextricably tied to nature, whether they live in cities or countryside. Rather than attempt to exclude humans, environmental advocates should help us learn to live in some sustainable relationship with nature. It is our home.